From the beginning of my 20-year career in dog behavior, I have been asked, “What is the best dog food?” Over the years, my answer has remained the same: “It depends.” Truly, finding the best dog food for your dog depends on a lot of factors. 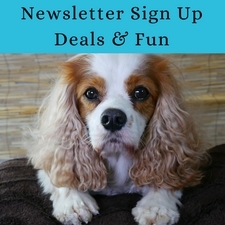 Are you looking for the best dog food for skin allergies, homemade dog food recipes, raw dog food recipes, or a prepared holistic pet food? When people ask me what the best dry dog food is, I basically cringe. I get it. I know some people are always going to feed a dry dog food, but I don’t think a dry pet food is the healthiest option for your dog and certainly not for your cat. Dry pet food is heavily processed at high heat, removing all the moisture and goodness from the food. Fresh food, whether from a balanced home-cooked diet, balanced home-prepared raw, raw pet food company, or home-cooked pet food company will always provide a fresher, healthier diet. When people ask me for the best dog food, I assume they want to feed their dogs a species-appropriate, high-quality dog food. I personally look for several things when evaluating the quality of a dog food. In a good dog food, I’m looking for meat, meat, and more meat. I shoot for 70% or more meat in Dexter‘s diet. I look for meats free of antibiotics and hormones. 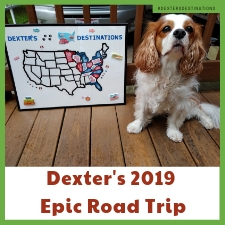 The remaining portion of Dexter’s food can be healthy fruits and vegetables, and I’m not opposed to healthy grains or carbohydrates in small quantities. Ideally, I look for ingredients that are organic, human-grade, and sourced in a country with a good quality-control program. Figuring out all the details when choosing a pet food brand can be time consuming, but Dexter is well worth the time. If you have visited Raising Your Pets Naturally in the past, you probably know that I home-cook for Dexter almost exclusively. However, I do occasionally recommend and use great dog food brands, especially when traveling. Darwin’s Pet Products is one of those brands. I’m a big fan of a raw-food dog diet. However, it’s not for every person, and it’s not for every dog. Dexter is one of these dogs. With Dexter’s neurological condition and weakened immune system, he does not tolerate a fresh raw diet very well; he tends to get the scoots. However, Darwin’s raw dog food can be gently cooked “rare” (i.e., cooking the meat, but not the ground bones). This is what I do when feeding Darwin’s to Dexter, and he does great, with no digestion issues. 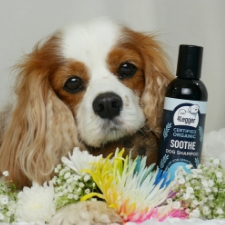 Does Dexter like Darwin’s Natural Pet Products? Seriously? You have to ask? Dexter is a huge fan. He gobbles up every last morsel and looks at me for seconds. The question should be whether or not I like a particular pet food brand. I have been a fan of Darwin’s Natural Pet Products for a few years, and even rotate their cat food into Nutter The Cat‘s diet. Darwin’s raw dog food is 75% meat, 25% vegetables, and under 1% trace minerals and vitamins. No guesswork on how much meat your dog is getting. And it’s not low-quality meat that you might find in a rendering plant or low-quality pet food manufacturing facility. Darwin’s offers two dog food lines: Natural Selections and ZooLogics. Their Natural Selections line contains high-quality, antibiotic- and hormone-free meats from New Zealand, Australia, and the USA, with organic vegetables. Their ZooLogics line is a more economical line of raw dog food, made with conventionally-grown meats and vegetables from the same farms that supply your supermarket. 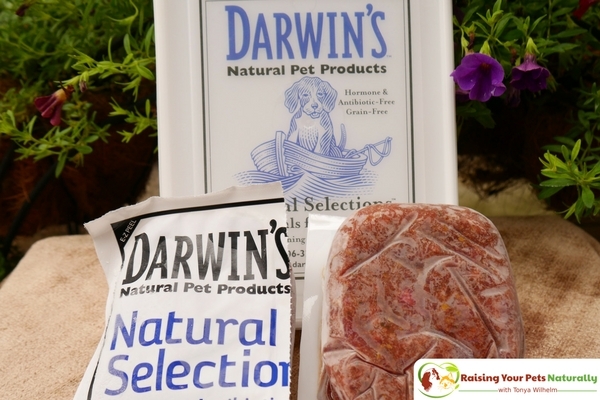 Currently, Darwin’s offers raw dog food made with chicken, duck, turkey, beef, or lamb. Darwin’s eliminates the middle-man by shipping directly to the customer. They even include a pre-paid return label so you can return the special insulated shipping container back to Darwin’s. If you live in the Seattle and Portland Metropolitan Areas, you receive free home delivery! 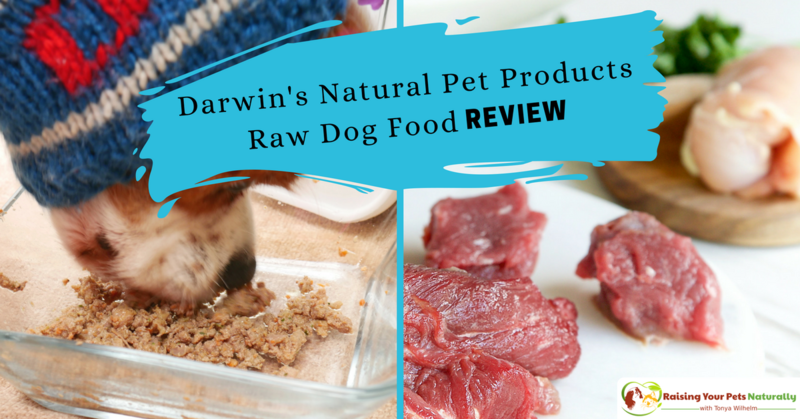 Darwin’s raw dog food is super simple to feed. Each 8-ounce frozen, vacuum-sealed bag has an EZ Peel tab in the corner, making it a breeze to open without a mess. They also provide a nice container with a lid to store any unused food. Frozen food can last at least six months when kept frozen. 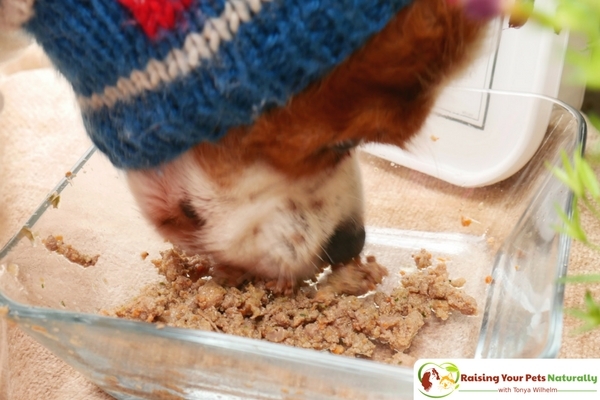 Once defrosted, keep the raw pet food in the refrigerator for up to two days. The first step in our transition was to thaw two packages of the raw Natural Selections turkey. This was easy—I just placed a block in the handy container provided, and popped it into the refrigerator for the day. The next day, I gently cooked Dexter’s food and allowed it to cool. Because Dexter is used to a variety of foods, I was able to quickly transition him to test out Darwin’s gently cooked dog food. I started with a 50/50 mix of his current food and Darwin’s. By day two, Dexter was happily eating Darwin’s raw turkey, but gently cooked. He was a happy camper! 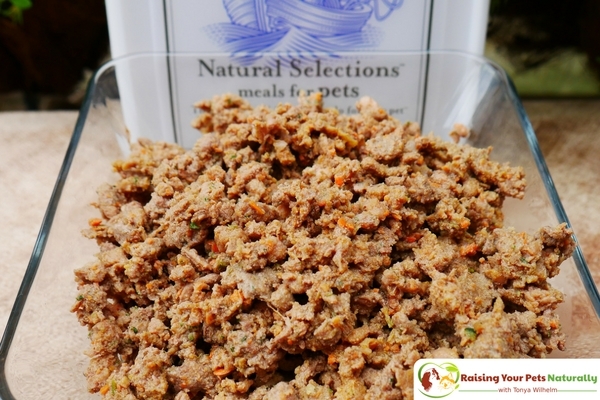 Darwin’s Raw Turkey Dog Food Ingredients: Free-Range Meat (76.90%): Turkey Necks (including bone), Turkey Thigh Meat, Turkey Livers, Turkey Hearts, and Turkey Gizzards. Organic Vegetables (22.34%): Romaine Lettuce, Yams, Zucchini, Carrots, Yellow Squash, Celery, and Parsley (vegetables may vary based on seasonality). Special Nutrient Mix (0.77%): Organic Flax Seed Oil, Sea Salt, Iron Proteinate, Zinc Proteinate, Choline Chloride, Vitamin E, Copper Proteinate, Manganese Proteinate, Thiamine Mononitrate, Vitamin B12, Iodine, Vitamin D3. Free-Range Meat (76.90%): Turkey Necks (including bone), Turkey Thigh Meat, Turkey Livers, Turkey Hearts, and Turkey Gizzards. Organic Vegetables (22.34%): Romaine Lettuce, Yams, Zucchini, Carrots, Yellow Squash, Celery, and Parsley (vegetables may vary based on seasonality). Special Nutrient Mix (0.77%): Organic Flax Seed Oil, Sea Salt, Iron Proteinate, Zinc Proteinate, Choline Chloride, Vitamin E, Copper Proteinate, Manganese Proteinate, Thiamine Mononitrate, Vitamin B12, Iodine, Vitamin D3. If you are unsure where to start in your selection or transition, Darwin’s offers a free menu consultation. Darwin’s Intelligent Design™ Veterinary line is a great option for dogs who need a special formulation for a medical issue. These are specialized formulas designed to provide extra support to dogs facing certain health issues. Unlike your typical “veterinary diet,” these meals are actually made with high-quality, real food! Darwin’s Natural Pet Products raw dog food is a total hit with both Dexter and me. 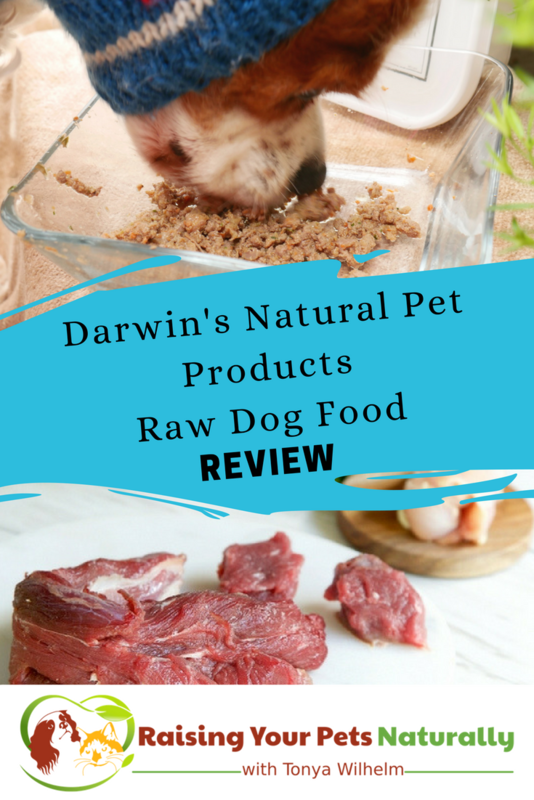 If you are looking to find a high-quality raw diet for your dog, I urge you to check out Darwin’s Natural Pet Products. Tell them Dexter sent you. Do you feed a fresh diet to your pets? Tell me in the comments. I am always waiting for your next post. 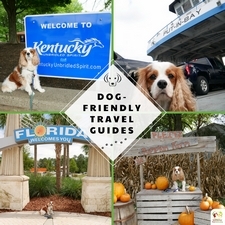 This blogs are really essential for pet/dog lovers as we were able to get an updated tips and news for our love dogs. I will check on this Darwin’s Dog Food. Thanks so much for sharing. You are sweet. Thanks for that Eliza. I absolutely love dogs. I don’t owe one yet but I will adopt few pups soon. And this is a great post for all those proud parents of dogs. I do not use raw foods for my pets. Darwin’s Natural Pet Products sounds like an interesting brand. My dogs would like the lightly cooked food. Darwin’s has amazing quality. Yes, Dexter can only do it lightly-cooked. I’d love to put my pup on a raw diet but it’s just so expensive here it is out of the question. I try and get her the next best food I can though. Will recommend this to people though, looks good. Thanks, Kim. Raw can be pricey, but also can pay off with a pet’s great health. That sounds like an awesome brand of pet food. I don’t have a dog anymore, but if we ever are ready for another, I will check out this food. We feed our dog with cooked rice and meat. Is that good for dogs? We sometimes give them the dry dog food but only when we don’t have food ready in the house. I hadn’t heard of this brand before, so thank you for sharing. I wish I could do home cooked, but it’s just not for us at the moment. This definitely helps those who want to feed raw. Glad to share Darwin’s. It’s definitely handy when someone doesn’t have time to prepare food. I haven’t heard of Darwin’s Natural Pet Products but this is fantastic. Feeding your sweet family pet good healthy means is so important. Glad to introduce Darwin’s to you. Such a great brand. Food is everything! My two doggies would absolutely LOVE this product. I mean, what dog doesn’t love meat?! And I love that it’s all natural. Thanks for sharing!! Will be checking this out.. I dont know much about dogs or dog foods but this sounds great. I will pass the info along to friends! Thanks for sharing! I love introducing people to great health and food. Dry food is terrible for dogs and cats. Carnivores need a high-meat and moisture diet. Dry foods wreak havoc on kidneys. I have a cat and we feed him a combination of wet and dry food which he loves. We buy top quality brands as he is very finicky and I don’t want him to eat food that isn’t made properly. No, we don’t cook for him or give him stovetop foods. That said, I’m impressed by the effort you make to prepare meals for your dog. I can appreciate this post. I don’t currently have pets however before my last one passed away, I definitely have learned about the benefits of raw foods for our pets. Thanks for sharing yet another option for pet owners to consider for their beloved fur kids to enjoy. Thanks, Kamira. I love sharing great brands and product to my friends. Thanks for the comment. I have recently started my cats on Darwin’s and they love it. Tibet especially! There is this sound Tibet makes when she is proud of herself. Every time she captures a beetle that got into the house or one of my hair ties she makes this sound. It tells me “I am a huntress and I have captured this for you, my human”. My point, yes I am getting to it lol, is that Tibet makes this same sound when I serve her Darwin’s Raw Meat diet! It brings out her true nature! hahaha I love it! It’s so great to see our pets enjoying real, healthy food. Way to go for the change! I’m so embarrassed and disappointed in myself for not caring more about the food that goes into my dogs mouth! Especially when I’m so picky about what the rest of the family eats! Thank you for the reminder! No need to be embarrassed. It’s all about education and thinking about it from a nutritional stand point. I’m the opposite, I’m TERRIBLE with my own food. People often say I should eat like Dexter! Love, love, Darwins!! 🙂 Always in our fridge/freezer. I’m always on the look out for some great and healthy food for my dog! I definitely need to look into this, i think we might be making a switch! That would be great! Darwin’s pet is such a healthy food and conscious company. You can buy with confidence. When you say “cooking gently”, how gentle? I’m curious because I am considering it for my dog to do the same with Darwin’s. I am not a fan of feeding pets dry food either. After all we wouldn’t want to be pumped full of hormones so why should we do it to pets. A raw organic diet sounds best! I totally agree. I can’t imagine us eating Cheerios every day being healthy. 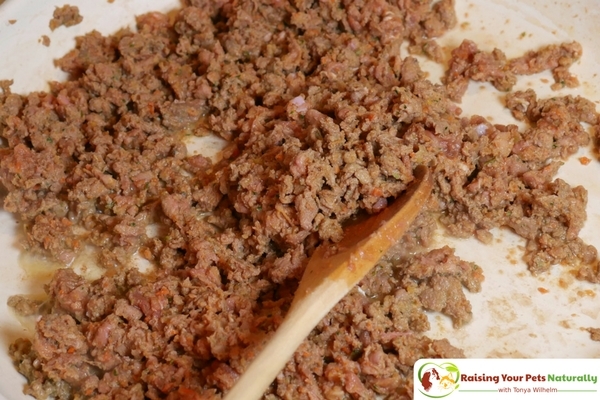 We’ve been hearing so much about raw feeding lately. However, our mom still hasn’t taken the plunge and tried it with us yet. Maybe she needs to! Nice review. I have been reading a lot about this lately but unfortunately when I tried with Layla, did 3 meals it was not good for her so switched to cooking for her and adding the Grandma Lucy’s Macanna Pre-Mix which has all the supplements that she needs so am sticking to it. It is grain free, organic and produced in California. I was told only yesterday that I can order the Tripe from Darwins which I am going to look into to add to her food here and there 🙂 Slowly though as she is getting older so I have to be careful. Layla sounds like Dex, needs to have his food partially cooked or cooked. I really wish I was able to raw feed my animals but we have too many we have rescued right now. But I keep reading articles like this hoping someday we can. Thanks for the info. <3 Sure thing. Darwin's is an amazing company, maybe reach out to them. This is a topic of interest to me as I am experimenting with it. My dogs seem to like it better and are looking forward to meal time. I now need to try this with my cats. We recently went back to feeding our dogs an all raw diet. I get a bulk of their meat from the grocery store or butcher, but I’m always looking for some pre-made options that are already well balanced and ready to go. Definitely going to look into Darwin. I love that they do consultations too! Thanks, Debbie. Yes, Darwin’s offers a lot of great options to the consumer. I don’t feed raw nor do I cook for my girls (I rarely cook for myself). however, I always like to read post from people who are successfully feeding their pets raw and home cooked meals. I don’t cook for myself either! I’ve never heard of this brand. However, I have been needing a new food for my dogs and my vet suggested a raw diet. Glad I saw this! That’s awesome! It sounds like you have an amazing vet! I had no idea that there were so many variabl3es when looking at raw dog food. I would think that they would be all the same, but I’m mistaken. What a great review! Thanks. No, very different between brands and their quality. I’m glad you found a food that works so well for Dexter! It can be a challenge finding a food that is healthy and affordable. Only the best for the fur babies! I have a friend that only feeds her dog raw food. I bet she would find this review very useful! Thanks, Marielle. Please feel free to share with your friend. I think a food like this is great if you want to feed raw, and you have both the time to cook for pets and the money to purchase quality raw food. I can see it has a lot of quality ingredients in it, thanks for sharing. Thanks, Cathy. Yes, amazing, fresh, ingredients. I recently acquired another dachshund, and the food I was feeding Charlie is too expensive to feed two. The second dog was eating a product I wouldn’t use, but he adapted easily to the fresh food I give Charlie. I’ll take a look at Darwin’s as an emergency backup when I need one. Thanks, Linda. Nothing wrong with home cooking! We don’t have this one available around here but we do feed raw. We actually have some pretty good Canadian companies to choose from. As well, of course, whatever Cookie catches. I started my transition to a raw diet with Darwin’s. It just doesn’t get any more convenient! I can’t afford their food on a regular basis because it gets a little pricey with having to feed 2 Boxer mixes, but their quality certainly is top notch. This sounds like such an interesting brand. I try to eat natural so why shouldn’t my puppy. I would try this brand. That’s great! 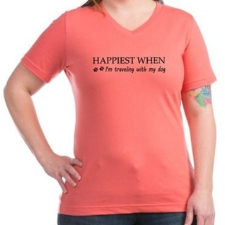 It’s such a healthy brand for dogs and puppies. I have been using Darwin’s for about a month now and my dogs love it. Could you explain how you “gently cook” the raw food? I know that you are not supposed to cook bone and the turkey does have ground bone in it. Is it ok to gently cook this? Thank you! Hi, Linda. Glad you are a Darwin’s fan. Yes, they said I could gently cook (I cooked in pan), to a raw consistency. So, I basically just cooked it up a bit, bones would still be pretty soft, not to mention they are very small. Hey, a very good write up and you really shown that how much you love and take care of your dog. But i like dogs at other home only. I never gave my dog human food because I heard it was so bad for them. I feel bad giving her the “dog” food though because it doesn’t look like steak. This looks like a great alternative! I don’t have a dog at my place, Will share with a friend..she will like it! I give my dog dried food as he doesn’t always eat it (all) straight away, so it’s not good to have fresh food sitting about. Be careful just leaving dry food around, that too causes problems. Sorry, he’s not enjoying his food to eat it right away. We’ve been feeding Darwin’s to our Airedale for 2 years with great success. She is now 3 y.o., healthy, active and loves Darwin’s. We supplement some with sardines, extra veggies like asparagus, broccoli blueberries and brussels…what ever we are eating… and daily some Answers fermented raw goats milk. Thanks for your efforts to raise awareness and generate helpful discussions! Hi, Tom. Thanks for the comments. I love that your Airedale is doing well on Darwin’s and the fun additions. Glad to have you as a reader! Considering switching to raw diet for my dog. He eats Freshpet now but I just discovered the harms of carrageenan in his dog food and want to make a change. This may be an obvious question – but because the meat is raw, do you all thoroughly wash the bowl right after he’s done eating? How do you take precaution with bacteria especially when you have children?